I think we can all agree that the world would be a better place if everyone was exactly like me. Well, not like me, necessarily, just exactly like each other, but since I’m writing this from the confines of my own brain, that’s how I’ll imagine it. Think of the peace! The concord! We’d all have the same views on religion and politics. Would we even need politics anymore? We’d have no disputes to settle, no conflicts to solve. We’d have a natural empathy that would require no effort at all. We’d understand each other’s needs because they’d be our needs! So much nastiness in life is caused by envy and insecurity, but those problems would be eliminated. Nobody would be prettier than anyone else, or smarter, or more successful! Everybody would be equally good at the same things. Of course, everybody would be equally bad at the same things, too. So if everybody happened to be exactly like me, we’d have no buildings to live in, in fact our shelters would be ramshackle at best. We wouldn’t be able to help much if people got sick, because we’d never have been able to invent medicines. We wouldn’t have cars and roads, but we’d be okay with that because we’d all be pretty happy just walking around town. Of course we wouldn’t be a town, just a disorganized mess of poorly constructed lean-tos. And when there was a thunderstorm we would all go into a cold panic, huddled in our hovels, with no rational person to comfort us. We would all appreciate each other’s films (although in certain moods we’d be hyper-critical of them), and they wouldn’t cost much, because all of us would decide that we have no need for money. But we wouldn’t actually be able to make them, because we wouldn’t have ever invented the technology necessary. We would like all the food we made, but we’d have limited supplies to cook with, because we’d have no idea how to harvest wheat, or how to grow half the vegetables that we would love to eat if only we’d ever encountered them. And would we even want to cook anymore? Because we wouldn’t have the joy of sharing something with somebody, waiting to see if they like it, and then rejoicing when they do. And, you know, it wouldn’t be too boring at first, because all of us talk to ourselves in our heads half the time anyway. Eventually, yes, it might get a little stale to never ever have a new idea based on some experience you’d never had yourself, to never hear a word you’d never heard before. To never have a conversation with somebody that’s delightful because it’s completely unexpected and surprising. Never mind the fact that after a few nights of insomnia I’m so sick of my own damn thoughts that I could cry. Never you mind that! And we’d all get along, and it would be pleasant enough, we’d all sort of be friends. But there wouldn’t be anybody to be a special friend, to share a moment of unexpected intimacy, to charm you with their odd turns of phrase and fascinate you with their unique experiences or beliefs. There wouldn’t be anybody to vex you with their contrariness. There wouldn’t be anyone to surprise you with an unexpected gesture. There wouldn’t be anybody to love because they’re strange to you and you’ve never met anybody like them. 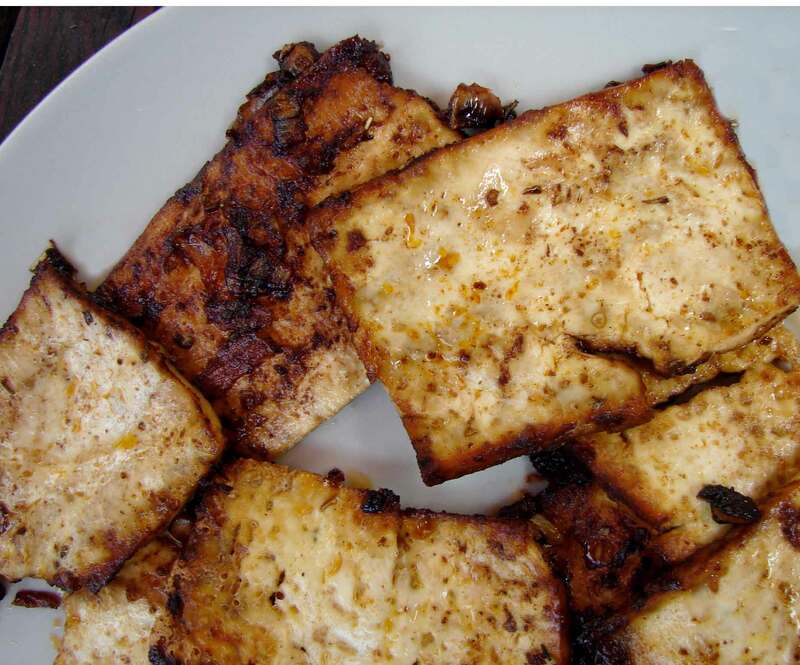 This is only the second tofu recipe ever on my vegetarian food blog! Weird, right? The truth is I only like tofu when it’s crispy, so I fry it in olive oil on the stove, but then my kitchen smells funny for days. Well, I thought I’d try roasting it. And I roasted it in a sauce made of smoked paprika, tamarind, chipotle, onions, shallots, sage…a version of barbeque sauce, I guess. I think it turned out very good. Not crispy, exactly, but with a nice texture, firm and yummy. The boys liked it, too, which was my goal in making it in the first place. The kids need protein! Drain the tofu in a strainer. I placed a plate on top with a can of beans in it, to weigh it down. Slice it in half, and then into rectangles about 1/4 inch thick. Preheat the oven to 425. Lightly coat a baking sheet with a short rim with olive oil. Spread the tofu in an even layer on the sheet. Spoon the sauce over the tofu, spreading it in a thin even layer. Bake for about 1/2 an hour, turning from time to time (carefully, it falls, until the tofu starts to brown on the edges. 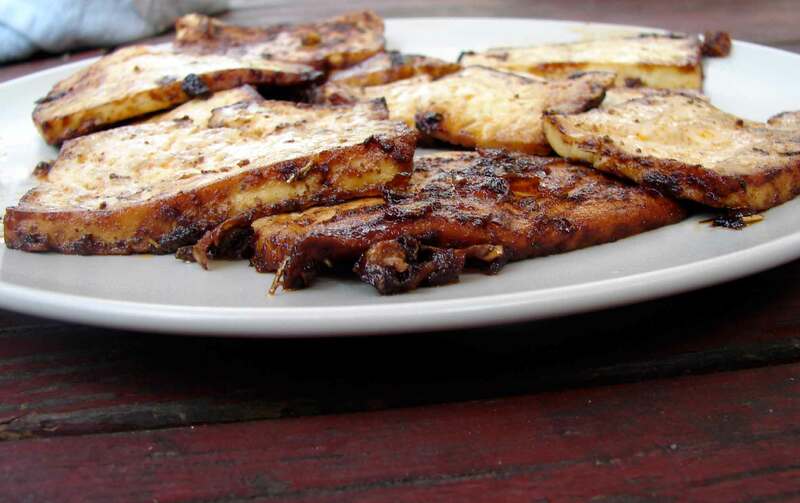 This entry was posted in recipe, sauce, Uncategorized and tagged barbeque sauce, chipotle, roasted tofu, tamarind, tofu by Claire. Bookmark the permalink.